1, They are planted too shallow or too deep. 2, They are getting too much nitrogen. 3, They are over or undernourished. 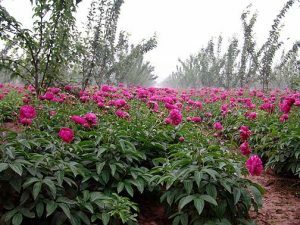 Peonies thrive with little care and limited amounts of fertilizer. 4, The buds were killed at late frost, disease, or excessive heat. In hot(ter) climates early flowering varieties should be planted. 5, There was not enough light for buds to form. 6, The plants are too young or immature. 7, The clumps are too large or overcrowded. 8, They have been moved or divided too often. 9, The plants were cut back before the foliage turned brown in Autumn. 10, He soil is too wet or too dry. Peonies require well-drainedsoil but also like to be watered down to the bottom of their roots. Let the soil dry out slightly between waterings.